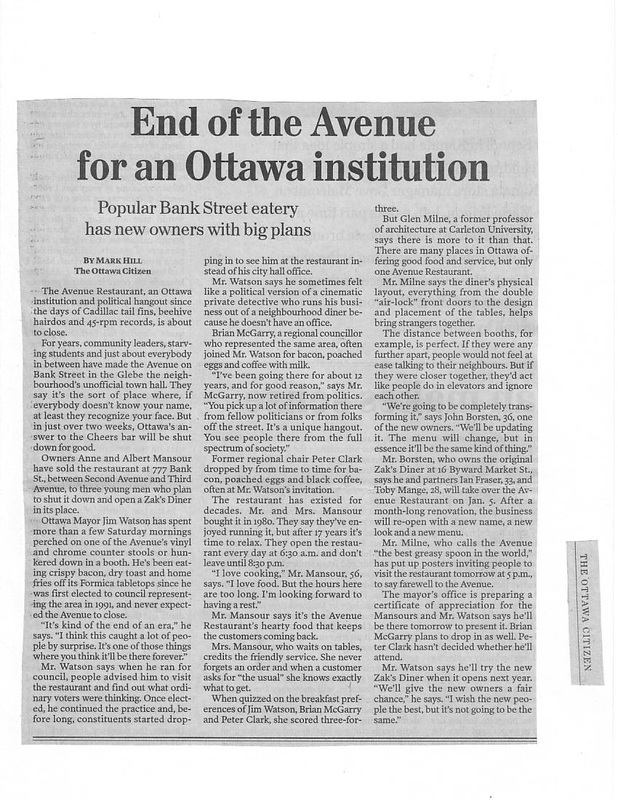 The Avenue Restaurant, an Ottawa institution and political hangout since the days of Cadillac tail fins, beehive hairdos, and 45-rpm records, is about to close. For years, community leaders, starving students and just about everybody in between have made the Avenue on Bank Street in the Glebe the neighbourhood's unofficial town hall. They say it's the sort of place where, if everybody doesn't know your name, at least they recognize your face. But in just over two weeks, Ottawa's answer to the Cheers bar will be shut down for good. Owners Anne and Albert Mansour have sold the restaurant at 777 Bank St. to three young men who plan to shut it down and open a Zak's Diner in its place. Ottawa Mayor Jim Watson has spent more than a few Saturday mornings perched on one of the Avenue's vinyl and chrome counter stools or hunkered down in a booth. He's been eating crispy bacon, dry toast and home fries off its Formica tabletops since he was first elected to council representing the area in 1991, and never expected the Avenue to close. "It's kind of the end of an era," he says. "I think this caught a lot of people by surprise. It's one of those things where you think it'll be there forever." Mr. Watson says when he ran for council, people advised him to visit the restaurant and find out what ordinary voters were thinking. Once elected, he continued the practice and, before long, constituents started dropping in to see him at the restaurant instead of his city hall office. Mr. Watson says he sometimes felt like a political version of the movie private-eye who runs his business out of a neighbourhood diner because he doesn't have an office. Brian McGarry, a regional councillor who represented the same area, often joined Mr. Watson for bacon, poached eggs and coffee with milk. "I've been going there for about 12 years, and for good reason," says Mr. McGarry, now retired from politics. "You pick up a lot of information there from fellow politicians or from folks off the street. It's a unique hangout. You see people there from the full spectrum of society." Former regional chair Peter Clark dropped by from time to time for bacon, poached eggs and black coffee, often at Mr. Watson's invitation. The restaurant has existed for decades. Mr. and Mrs. Mansour bought it in 1980. They say they've enjoyed running it, but after 17 years it's time to relax. They open the restaurant every day at 6:30 a.m. and don't leave until 8:30 p.m.
"I love cooking," Mr. Mansour, 56, says. "I love food. But the hours here are too long. I'm looking forward to having a rest." Mr. Mansour says it's the Avenue Restaurant's hearty food that keeps the customers coming back. Mrs. Mansour, who waits on tables, credits the friendly service. She never forgets an order and when a customer asks for "the usual" she knows exactly what to get. When quizzed on the breakfast preferences of Jim Watson, Brian McGarry and Peter Clark, she scored three-for-three. But Glen Milne, a former professor of architecture at Carleton University, says there is more to it than that. 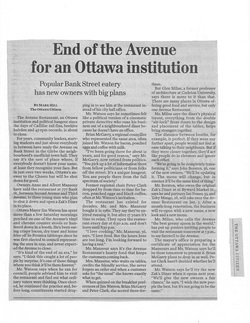 There are many places in Ottawa offering good food and service, but only one Avenue Restaurant. Mr. Milne says the diner's physical layout, everything from the double "air-lock" front doors to the design and placement of the tables, helps bring strangers together. The distance between booths, for example, is perfect. If they were any further apart, people would not feel at ease talking to their neighbours. But if they were closer together, they'd act like people do in elevators and ignore each other. Now that's all set to change. "We're going to be completely transforming it," says John Borsten, 36, one of the new owners. "We'll be updating it. The menu will change, but in essence it'll be the same kind of thing." Mr. Borsten, who owns the original Zak's Diner at 16 Byward Market St., says he and partners lan Fraser, 33, and Toby Mange, 28, will take over the Avenue Restaurant on Jan. 5. After a month-long renovation, the business will re-open with a new name, a new look and a new menu. Mr. Milne, who calls the Avenue "the best greasy spoon in the world," has put up posters inviting people to visit the restaurant tomorrow at 5 p.m., to say farewell to the Avenue. The mayor's office is preparing a certificate of appreciation for the Mansours and Mayor Watson says he'll be there tomorrow to present it. Brian McGarry plans to drop in as well. Peter Clark hasn't decided whether he'll attend. Mr. Watson says he'll try the new Zak's Diner when it opens next year. "We'll give the new owners a fair chance," he says. "I wish the new people the best, but it's not going to be the same."